Bike Pic Nov 25, driving a bike vs. car saves! This happy bike family is enjoying more of their discretionary income on fun things now that the car is seldom used. 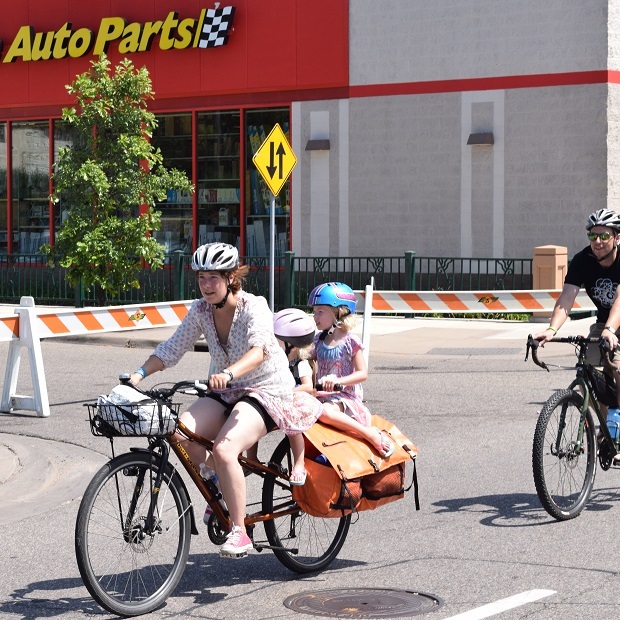 Photo taken at the 2015 Open Streets Minneapolis, on East Lake Street, this last summer. Now, rolling into our 10th year as a bicycle media, our goal is to continue to encourage more people to bike, whThis happy family is enjoying more discretionary income on fun things now that the car is seldom used.ile showcasing unforgettable places to ride. As we search and present more fun photos worth a grin, scroll through the information and stories we have posted to help you find your next adventure. Then, while out there if you see us along a paved or mountain bike trail, next to the route you regularly commute on, or at an event you plan to attend with your bike, be prepared to smile. You never know where our camera’s will be and what we will post next! This entry was posted in News and tagged #FindYourNextAdventure, #onlyinMN, bicycle commuting, Bike commuting, Bike/Walk Minneapolis, Open Streets on November 25, 2015 by Russ Lowthian. 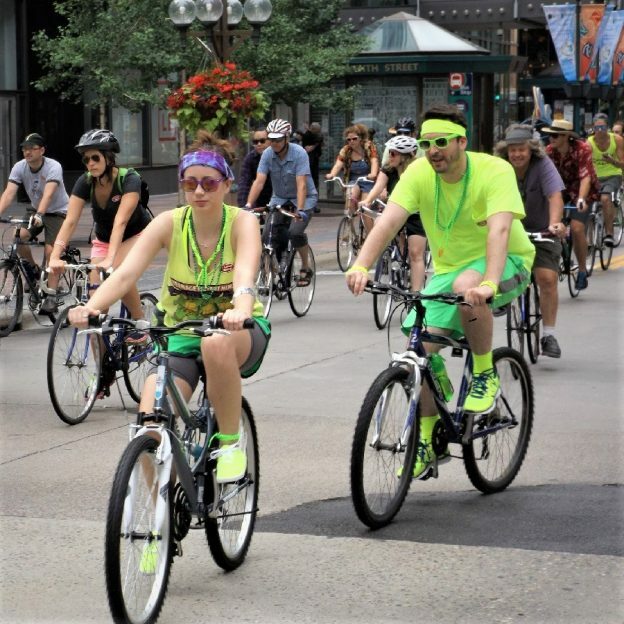 Here are a couple of cyclists riding the bike friendly streets of Minneapolis having fun near Midtown Greenway market area on Lake Street. Click here for maps to navigate the Twin Cities. Thanks for viewing the Bike Pic of the Day here at HaveFunBiking (HFB), hope you enjoyed the photo. As HaveFunBiking continues to encourage more people to ride, please reference our blog and the annual print and quarterly digital Bike/Hike Guide to find your next adventure. We are proud of the updated – At-a-Glance information and maps we are known for in the HFB Destination section on our website and in the guide. Now, as the Bike/Hike Guide goes into its seventh year of production, we are adding a whole new dimension of bicycle tourism information available for mobile devices where you may see some additional bike pics – maybe of yourself. Have fun and a great day! This entry was posted in News and tagged Biking Minneapolis, Open Streets, Road Biking Minnesota on November 3, 2015 by Russ Lowthian. Bike Pic Oct 27, Ready for Halloween? With three days and counting, bicyclists of all ages are planning their costumes for this Saturday’s ‘All Saints Eve’ event. Here, this young cyclist was spotted a few months early parading down Open Streets Minneapolis, at the East Lake Street event. Now, rolling into our 10th year as a bicycle media, our goal is to continue to encourage more people to bike, while showcasing unforgettable places to ride. As we search and present more fun photos worth a grin, scroll through the information and stories we have posted to help you find your next adventure. Then, while out there you see us along a paved or mountain bike trail, next to the route you regularly commute on, or at an event you plan to attend with your bike, be prepared to smile. You never know where our camera’s will be and what we will post next! Bookmark HaveFunBiking.com and find your next adventure – we may capture you in a pic we post! This entry was posted in News and tagged 'All Saints Eve' event, fun bike photo opp., halloween, Open Streets on October 27, 2015 by Russ Lowthian. Even a quick cloud burst that wet the pavement couldn’t stop the fun at Open Streets Minneapolis, yesterday, in Northeast Minneapolis. Here volunteers from the BikeMN (Bicycle Alliance of Minnesota) tent were weighing-in, as the sky darkened, how much rain would really fall. This entry was posted in News and tagged Bike event - N.E. 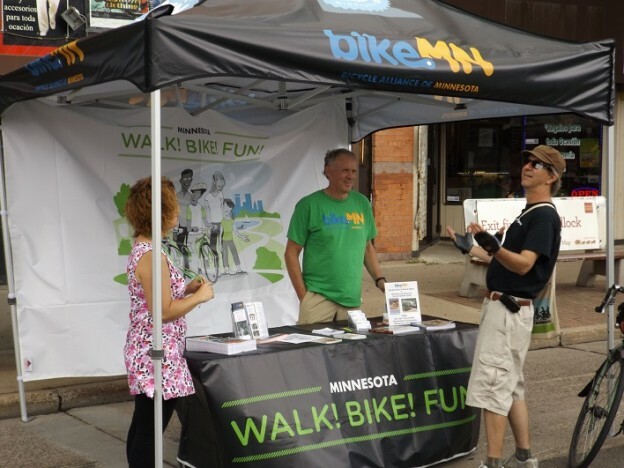 Minneapolis, Open Streets on July 28, 2014 by Russ Lowthian. Open Streets cannot be stopped! 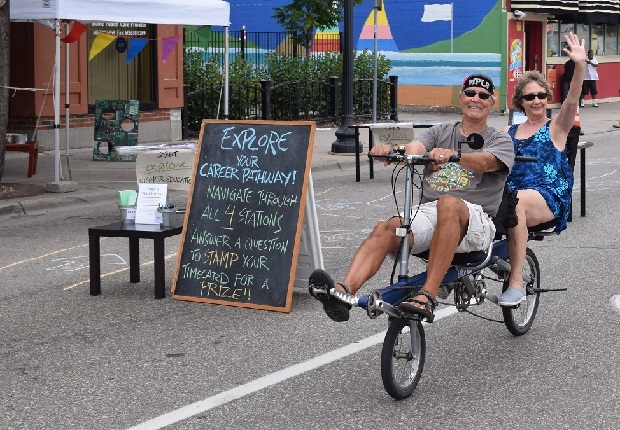 First Northside Greenway, then Lyndale Avenue, and now Open Streets is rolling into Northeast Minneapolis, on Sunday July 27th. Only two weeks out from today, Central Avenue NE. will be transformed into a safe, car-free area for people to bike, walk, play and hang with local businesses and artists. Come be a part of the magic and sign up to volunteer today! Volunteers help with everything from facilitating chalk art activities at intersections to helping us keep the street clean and car free. 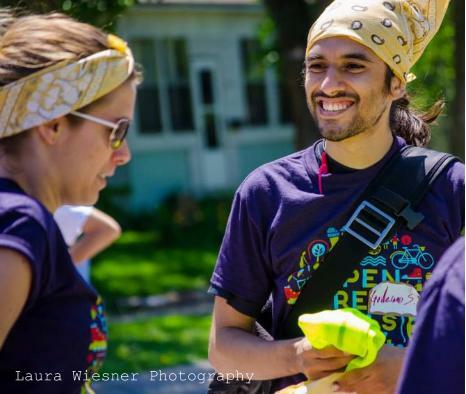 We’ll need about 90 volunteers to sign up for this event, so help us keep the momentum of Open Streets going by volunteering for a couple hours on July 27th at Central Avenue NE! You choose the location, the time, and what you’ll do — we give you a t-shirt, a volunteer appreciation party, and a lot of high fives. Couldn’t get much better than that! 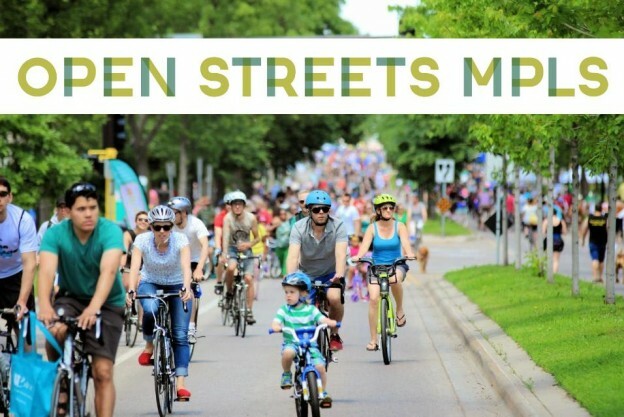 Check out openstreetsmpls.com/get-involved/ for a complete listing of volunteer options and to get involved. Thanks so much to all our volunteers. To learn more, visit openstreetsmpls.com or contact Beth Wagner at Volunteer@mplsbike.org. Open Streets Minneapolis has a number of financial and in-kind sponsors including the Minneapolis Bicycle Coalition, Center for Prevention at Blue Cross and Blue Shield of Minnesota, City of Minneapolis, Metro Transit, North Memorial Health Care, 89.3 The Current, car2go Minneapolis and Peace Coffee. Thanks to all our sponsors that make Open Streets Minneapolis possible. See you at Open Streets in Northeast Minneapolis! Can’t make it to Central Avenue Open Streets? 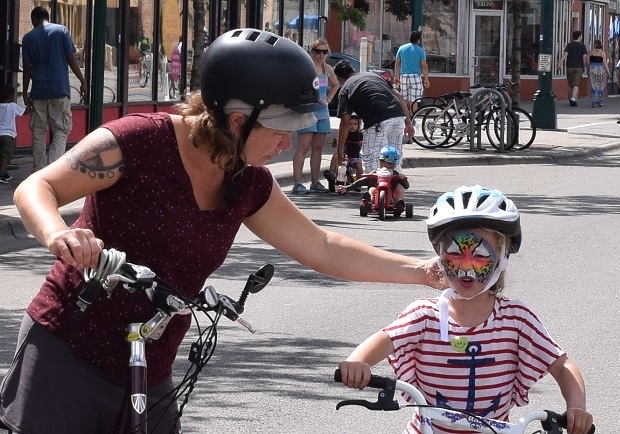 Sign up to be a part of Franklin Avenue Open Streets, on August 17th! This entry was posted in Uncategorized and tagged Open Streets on July 13, 2014 by Russ Lowthian.